You have a used electric wheelchair and no longer have a need for it. Whether you’ve obtained a newer motorized wheelchair or the person who used it has passed on, consider donating the power chair if it is still in good working condition. There are hundreds, if not thousands, of organizations that would graciously accept a used electric wheelchair. Below are a few ideas of ones you may choose to donate to. 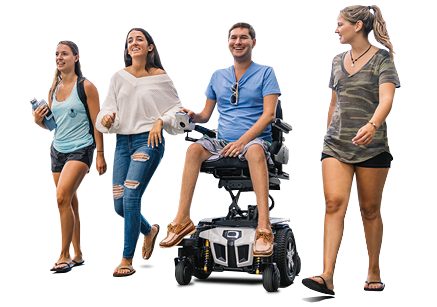 Non-profits for conditions that cause physical disabilities: People who use power wheelchairs often have a specific disease or condition that prevents them from walking. These include muscular dystrophy, amyotrophic lateral sclerosis (ALS), cerebral palsy, multiple sclerosis, spina bifida, and spinal cord injuries. These diseases and conditions have non-profit organizations related to them such as the Muscular Dystrophy Association, the ALS Association, United Cerebral Palsy, the National Multiple Sclerosis Society, the Spina Bifida Association, and the United Spinal Association. Veterans organizations: While the Veterans Affairs Administration provides power wheelchairs to some veterans, not all veterans are eligible. Or, a veteran may be waiting for his or her power chair to arrive and needs a mobility product in the interim. There are many different veterans organizations in existence. Quite a few of them will accept motorized wheelchair donations. Senior centers: Senior citizens centers usually exist through a variety of funding sources. They rely on donations and in many cases, government funding. These centers are focused on providing wellness services and activities. There is not always a lot of money available to the centers to buy electric wheelchairs and other mobility products. Donating a used electric wheelchair to a senior center can help improve the mobility of senior citizens. The center may loan the power chairs out for the day or even for some people to take home. Non-profit community organizations/religious groups: Many non-profit community organizations also heavily rely on donations, so they may not have a lot of money to purchase power wheelchairs. For example, a non-profit museum might have motorized wheelchairs on hand for visitors to use throughout the museum. The same is true for religious groups. Churches, synagogues, etc. might like to have a power mobility product or two for members of the congregation to use while on site. When donating a power wheelchair, it is helpful to include the owner’s manual. If you no longer have the paper owner’s manual that came with your power wheelchair, you may find a digital copy online. Click here to view Quantum® Power Chair owner’s manuals.